The Crassula family of succulents will always hold a special place in my heart. The first plant I ever truly remember loving and interacting with was a big beautiful Jade plant (crassula ovata) that belonged to my grandmother. Jade in itself comes in all forms of of different varieties including: gollum and hobbit jades, trailing jades, stacked jades, campfire jades and variegated jades, the list goes on! 3. They are easy to care for and prefer to go completely bone dry in between waterings. 5. They have a super appealing look with thick branching “trunks” and round glossy green leaves. 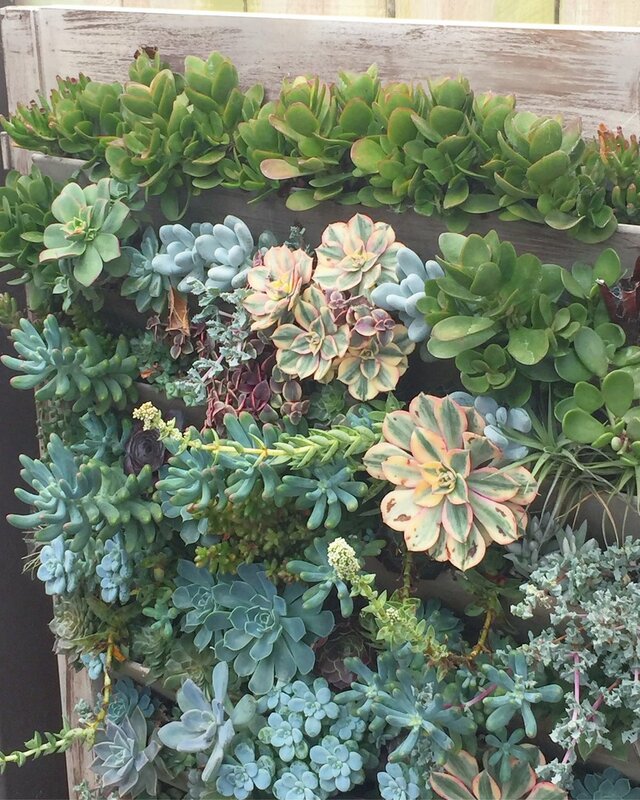 Crassula lining the top row of this beautiful planted shutters seen at Succulent Cafe Carlsbad. 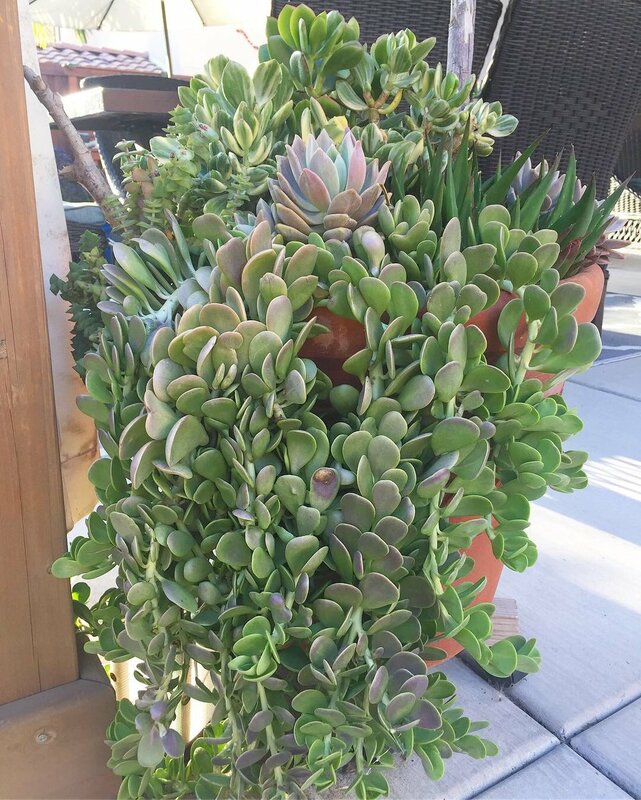 The CRASSULA Family of succulents encompasses a large variety of different plants including all the jades (crassula ovata), watch chains, stacked jades and the crassula perforata or “string of buttons”. Crassula are able to survive harsh conditions through the utilization of an interesting form of photosynthesis known as CAM - Crassulacean Acid Metabolism. In CAM photosynthesis, plants absorb CO2 (carbon dioxide) at night, to avoid water loss during the hot and often dry daytime of their native locales. Instead of opening their pores (stomata) during the day, in order to absorb CO2, which would lead to transpiration (water loss from the plant due to evaporation through the stomata), these plants absorb CO2 at night and convert it into a organic acid called malate. Then during the daylight hours they convert the malate back into CO2 and they can photosynthesize to their hearts’ content while the sun is out, without losing valuable water! LIGHT: Can vary - some prefer or can tolerate bright and direct sunlight, while other prefer more indirect sunlight. All do best in more bright indirect light, but many types of crassula ovata can do well in indoor and low-light conditions as well. WATER: These plants are hardy and can often tolerate many different situations and care techniques. They do not do well with frequent overwatering. Best to water thoroughly only when soil feels dry. If you have any questions regarding caring for Crassula don't forget about our new ASK the Botanist page!